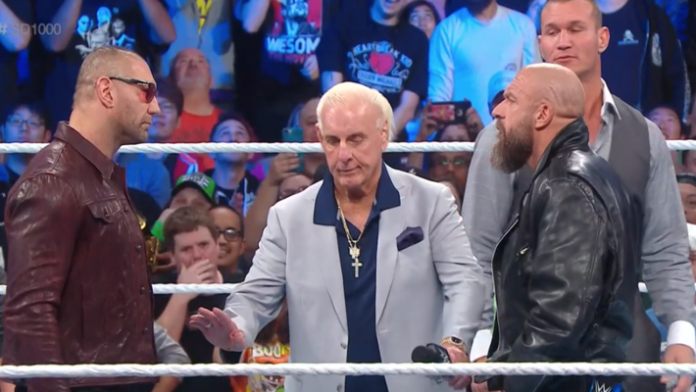 While SmackDown 1000 was able to balance between its various nostalgia acts and current storylines for the most part, a lot of people noted that the show felt rushed. According to a report at PWinsider, original plans were a lot different and the company made a number of late changes to the show’s. Original plans called for the World Cup Qualifying match between Rey Mysterio and Shinsuke Nakamura to open the special episode. However, WWE changed this order and went on with the Truth TV segment involving Vince McMahon as the opener, which was originally expected to take place later on. The Undertaker’s segment was always going to end the show, but it was cut short when the show ran longer than expected. Both Mysterio’s ring entrance and his match with Nakamura were cut short as well. Though the match between Rusev and The Miz was always scheduled to last a few seconds. Unlike the speculations, no changes were made to the original plan of this bout. Several segments were removed from the SmackDown 1000 as well due to the shortage of time. As noted before, one of these segments involving James Ellsworth ended up on YouTube later on. Regarding the Evolution Reunion, it was noted that Batista had not arrived in the Capital One Arena in his hometown of Washington, DC until around 7:40 pm ET for the show that was scheduled to start at 8pm ET. Although the site did not confirm the previous reports that claimed that Batista’s late arrival caused the mentioned changes in the script.